An indigenous oil services firm, Global Process and Pipeline Services Limited, says it is set to unveil its new office complex and operations base in Port Harcourt. 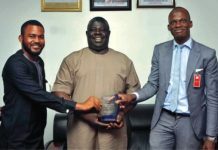 The Managing Director, GPPS, Mr Obi Uzu, said in a statement that the office complex and operations’ base would further enhance the firm’s efficiency for a superior service quality delivery in line with the highest industry standards and best practices and in accordance with the tenets of ISO 9001:2015. He said, “GPPS uses the best of equipment to offer services such as pipeline cleaning, de-oiling, hydro-testing, pipeline de-watering, drying and nitrogen services to the oil, gas and power industry. It is also involved in pressure pumping, nitrogen pumping, fluid pump support, lube oil flushing and high pressure water jetting and blasting services. “Our new office complex and operations base will further enhance our partnership with our clients to develop and maintain long-term relationships that add value to their projects. Our dedicated teams are experts in our line of business with a track record of safety and efficiency in executing complex projects in challenging environments. According to the statement, GPPS is a success story of indigenous specialists coming together to form an enduring partnership in the oil and gas service sector.